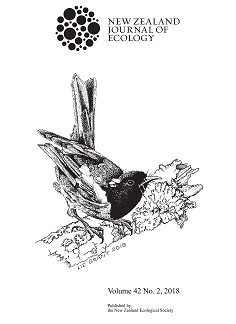 This issue of the New Zealand Journal of Ecology is the last to appear in print and online. From the next issue - the first of 2019, 43 (1) - the journal will be moving to online-only publication. The face of scientific publication is changing rapidly, and many journals in publishing houses big and small are moving to end print production. The society council strongly believe that the journal plays a crucial role in publishing high-quality research focused on New Zealand’s ecology and ecosystems. Since 1953 the Proceedings of the New Zealand Ecological Society and then the New Zealand Journal of Ecology have published 24 and 42 volumes, respectively, comprising well over 1000 scientific contributions. However, while The NZ Journal of Ecology remains (proudly) self-published, the costs associated with the production of the journal are a significant component of the society’s budget. Thus, after careful consideration the society’s Council has made the decision to move to online-only publication, reflecting both the costs associated with print production and the way we believe most readers access the journal. Although the journal will no longer be printed as hard-copy there will be no other changes, and we look forward to continuing to publish innovative and interesting ecological science in the years to come.